Saint Francis Medical Center announces that after 35 years of dedicated practice, Michael C. Trueblood, MD, orthopedic surgeon and Saint Francis Board member, has elected to retire. In 1978, after completing his medical degree, internship and residency at the Vanderbilt University School of Medicine in Nashville, Tenn. – in addition to a special projects residency in kinesiology at Rancho Los Amigos Hospital in Downey, Calif. – Trueblood moved to Cape Girardeau and started his career as an orthopedic surgeon at Saint Francis. For the next 35 years, Trueblood, his wife, Mary, and their two children would grow along with Saint Francis. Their daughter, Emily, was born three days after the family’s arrival in Cape Girardeau. 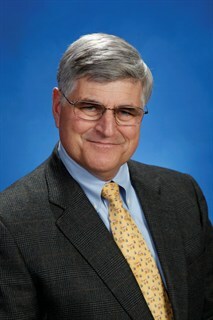 Their son, Andrew C. Trueblood, MD, would follow in his father’s footsteps as an orthopedic surgeon at Saint Francis. Meanwhile, Saint Francis continued to add more physicians, more facilities and more technological breakthroughs to complete its transformation into a regional leader. For Trueblood, being a great father and physician wasn’t enough. Wanting to give something back to a medical community that had given so much to him, he joined the Saint Francis Board in 1987. Helping the hospital expand for a new generation has been immensely fulfilling for him.